Today I don’t have a food haul (the only thing I bought this week was cucumbers, hummus and mini peppers) so I thought I would share a Halloween wrap up. I got quite a few questions about Halloween candy so I thought I would address them here. We did several Halloween events this year so I had an indoor and an outdoor costume for him. This also may have been because my mother and I really enjoy making costumes and couldn’t narrow it down. Back to food! For a playgroup party, local toddler gave out mini bags of pretzels. 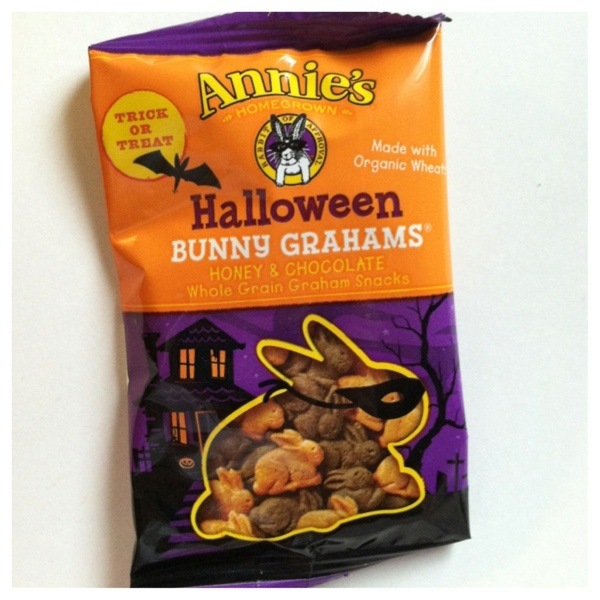 For our trick or treaters we had these super cute bags of Annie’s bunnies. Now, about all that candy. I can only speak to what my life experience tells me. What works for my family right now, might not work next year or for another family. In all honesty, there isn’t a huge overload of candy in our house. My son only went to about five houses last night before he decided that it was way more fun to pass out candy. 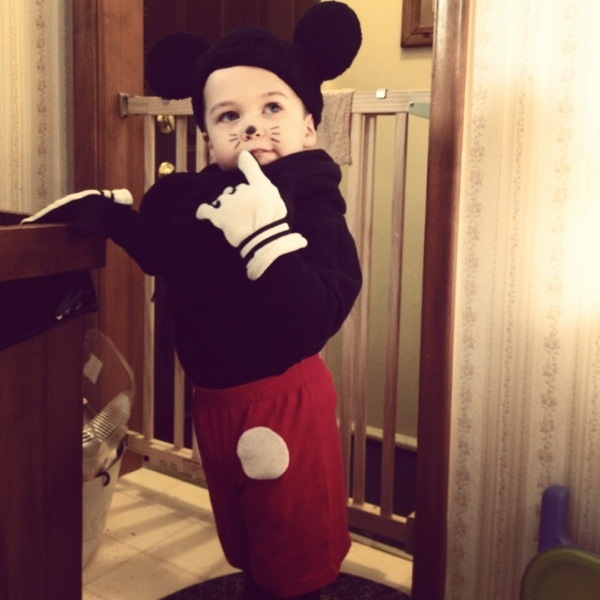 (His decision, he really had a lot of fun passing out candy and yelling out the door “Do you need a trick or treat? I have snacks, come get some candy.”) He was given some great snacks from friends and family (fruit puree pouches, yogurt melts, goldfish crackers etc). He only asked for a sucker last night and we happily obliged. I have the candy on a table and he knows it is there, and I will let him have one or two (after a meal). I stashed a few suckers aside for special prizes. However, we do not let him have chocolate. This is because he doesn’t tolerate chocolate well right now and it causes him stomach problems, I’m sure this will change as he gets older. My husband and I are happy to help some of the chocolate find a new home, the rest will probably find a home in my freezer. I’ve heard of all different ways of dealing with massive amounts of Halloween candy. Honestly, I have no idea what we will do when he really starts amassing massive amounts of candy. I’ve heard of many different suggestions, but I think it all comes down to knowing what works best for your child at that point in time. I consider myself an “everything in moderation” parent. I don’t think occasional candy will melt his brain, but I certainly don’t want it to be an every day thing in his life. I typically “let my hair down” about food for special occasions. He eats cupcakes and potato chips at parties, the occasional fast food hamburger etc. Our family tries for 80% real food, some days we are 100, some days lower. I think he is happy, healthy and well adjusted; which is really what we all want for our children. Most days he will choose cucumbers or grapes over candy, so I’m not going to worry too much about the days that the occasional candy wins. How was your Halloween? What did you give out? 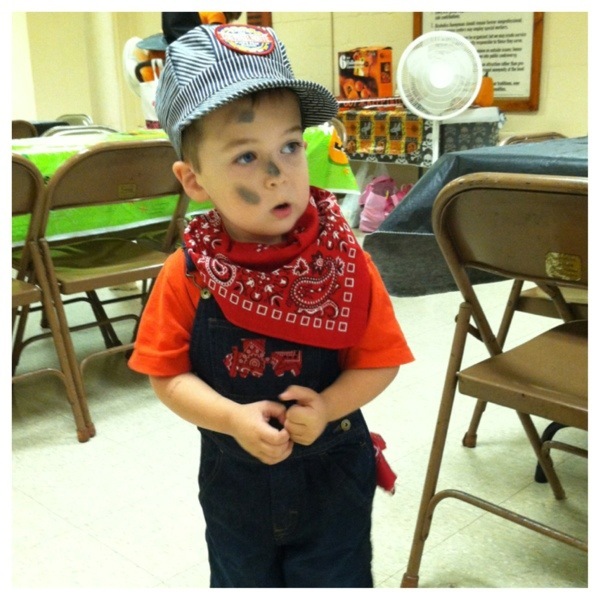 Did your kids get any treats that surprised you? Do you have any leftover peanut butter cups?! That last question sounded like you were phishing for more Reese’s cups lol. My philosophy is life 80% healthy 20% fun and on the holidays switch it! Works well for me and it comes from a doctor with over 30 years of holistic wellness experience so I can’t go wrong. “Local Toddler” looked adorable btw! I cannot confirm or deny that this household does enjoy some peanut butter cups! Jason’s makes “healthy” ones with dark chocolate that are delish! Sounds like the 80% philosophy is on point! Thanks! !